Ramadhan 2014 will start end of this month, expected to be on the 29th Jun; I am as excited as my Muslim friends because through this holly fasting month we learn from each other, go through the challenges, understand each other better and break fast together. I tried to fast before and it’s really a challenge, a lot of mental preparation and discipline required. Well, for the non-muslim you can also get an experience and appreciate the true meaning of fasting at Yeo’s Ramadhan Fasting Day-Out Camp 2014 through Titian Serasa Ramadhan. Well, Titian Serasa Ramadhan aims to get all Malaysians, regardless of race, belief, age, culture or background, to experience Ramadhan one-day fast to appreciate the different culture and practices of our Muslims friends. Imparting the good seeds of patience, self-control, and discipline, Titian Serasa Ramadhan is a platform to challenge our non-Muslim friends to brave through one-day of fasting while showing love, warmth and kindness to our community. Fees: RM10 (inclusive of 1 camp T-shirt, Certificate of Participation, Break-fast buffet dinner, one Yeo’s goodie). Your registration fees - RM10 will be contributed as duit Raya to orphans & equipment for the houses. 2. Bank in RM10 (inclusive of 1 camp T-shirt, Certificate of Participation, Break-fast buffet dinner, one Yeo’s goodie). Your registration fees - RM10 will be contributed as duit Raya to orphans & equipment for the houses. 3. Print screen your payment slip & fill up the online registration form here http://www.yeos.com.my/ramadhans-day-out-fasting-camp-registration-form/ & submit. Registration is first come first served basis maximum 500 participants. All registrations and payments are to be made before or on 6th July 2014, Sunday. 9.30am – 7.00pm Ramadhan Activities such as community work, visit to the orphanage, fashion show, talk show, group contest, games, meet new friends, lucky draw and many more. 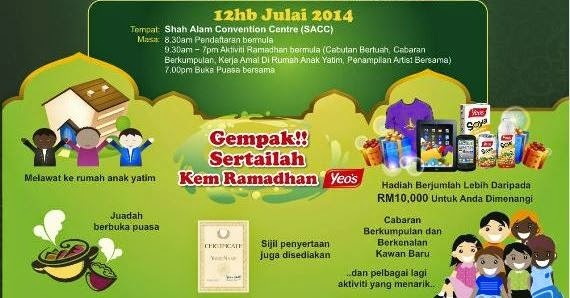 Yeo’s Ramadhan Day-Out Fasting Camp is open to 500 participants, members of the public from 15-years-old and above are welcome to participate in Ramadhan day-out fasting camp. Besides financial contribution to the participating homes, program includes community work with orphans such as house-cleaning and decorating the home for Hari Raya Aidilfitri. There will also be other exciting activities like a fashion walk and show, a talk show and group contest. And by the end of the day you will be given a Certificate of Participation that you have Pass and Fast for A Day at Yeo’s Ramadhan Day-Out Fasting Camp! Deal? One of the highlight, Yeo’s is always very generous with their lucky draw prizes so make sure you stay till the end because there gadget worth more than RM10,000 to be given away during the lucky draw session. WOW!!! Let's join! Not only that there will be artists from different races such as Champion Winner of Astro Talent Quest 2004, Fayse Goh, Top 5 Finalist of Akademi Fantasia Season-5, Heliza Helmi, singer and actress, KeQing, and fitness and lifestyle blogger, Abang Ben Ashaari, will also take part in this super exciting and meaningful event to appreciate the difference in culture and practices of Muslim while sharing love and warmth to our community. 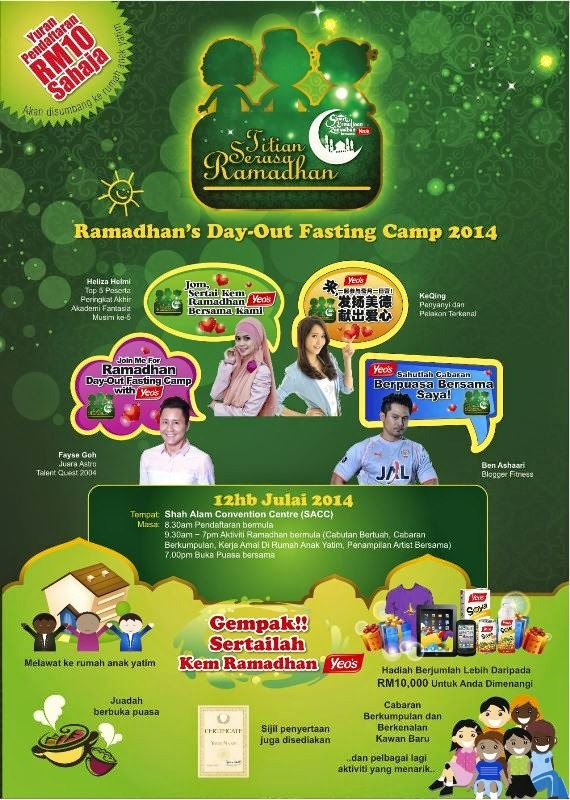 You, me and everyone is invited to participate on this Yeo’s Ramadhan Day-Out Fasting Camp. For more details please visit www.yeos.com.my or contact Yeo’s customer care hotline at 1300-80-2828 or 03-7787 3553 to find out more on how to join the event. Follow Yeo’s Malaysia on Facebook, Instagram, Twitter and hashtag #yeosramadhan to contribute to live tweets of Sinari Kemuliaan Ramadhan Bersama Yeo’s. Hi JL, thanks for visiting. Its it exciting & challenging for non muslim. it will be a good experience. I am joining, hope you can join us too. Even if I can't make it, RM10 is really not a big sum, just a small gesture to charity.